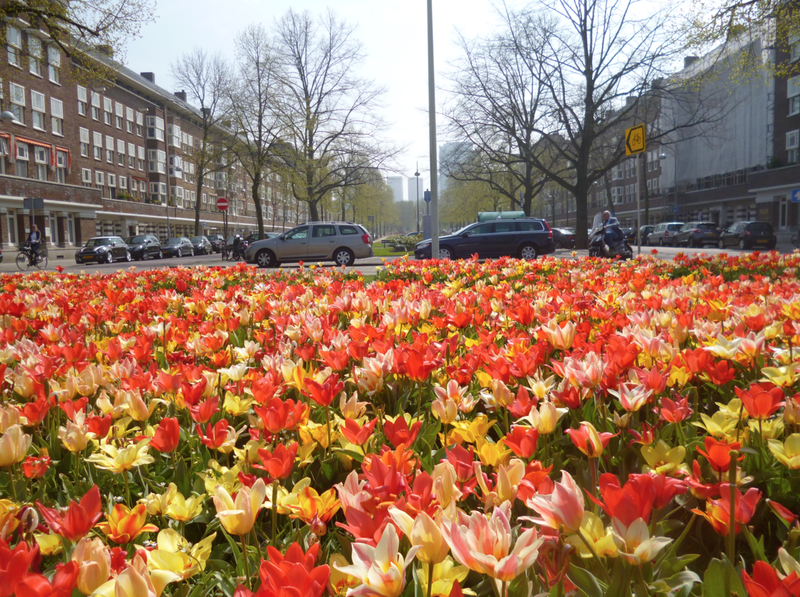 Tulips have long been synonymous with Amsterdam and yet in recent years, despite tourists being able to buy everything from soap to maracas in tulip form, the real things have been largely absent from our streets. 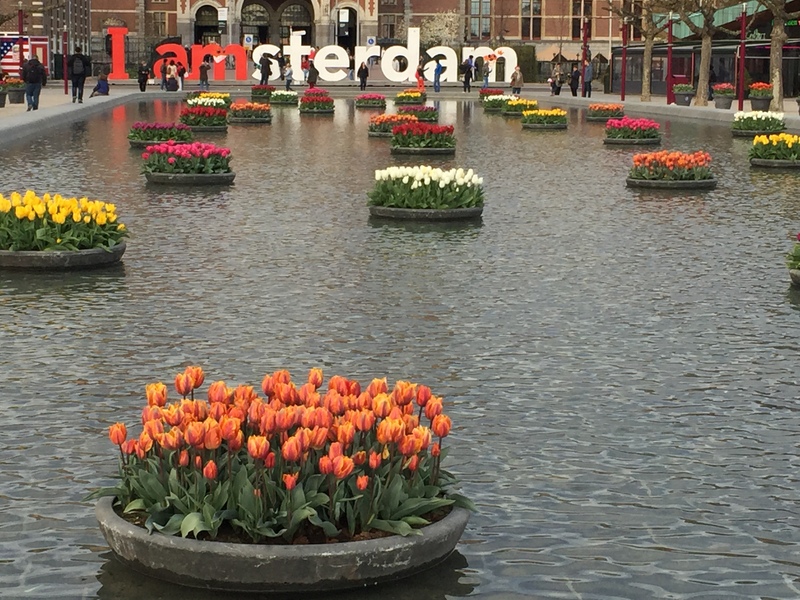 Esther O’Toole went to meet Saskia Albrecht, founder of the Tulp Festival Amsterdam, who’s on a one woman mission to put the tulip back in full view. In 2010, Saskia Albrecht was an experienced and reputable landscape gardener, responsible for the Open Garden Days at the Museum van Loon, when she hit on the idea of designing a special event around tulips. With hundreds of varieties, her favourite flower offered endless potential for spectacular springtime displays and, she felt, something quintessentially Dutch to boot. ‘I’ve always been busy with tulips, it seemed natural’, she says. With much planning, the first three-day tulip weekend was put into action at the museum, but it didn’t go exactly to schedule. It was too cold and the tulips didn’t come out on time. The following year, it was too hot and they bloomed early. Though she was able to continue her experiment successfully for a third year the weather remained a risk and the event was ultimately cancelled. For all her best laid plans Albrecht had to admit that ‘nature was just going to do it’s thing’ and she would have to go back to the drawing board. Then she visited Istanbul. Whilst there Albrecht heard that a massive tulip festival was taking place, but she could find no sign of it. Eventually, she managed to contact the organisers and was given a tour of the displays of millions of blooming tulips in the parks. More than a bulb for every one of the 14 million inhabitants of the city, a happy coincidence apparently. That was when the idea for the Tulp Festival Amsterdam struck her. Her initial efforts hadn’t failed because they were too ambitious, but because they were too small. Greater scale would allow for better management of the variables and so the dream of a tulip festival, with a bulb for everyone of Amsterdam’s inhabitants, was born. Tulips were first introduced to the Netherlands in the 1600s when they were brought back from Turkey by Dutch merchants. In 1637 the popularity of the flower amongst Dutch collectors had reached such a height that a single exotic bulb could sell for more than the annual income of a skilled craftsman, an unsustainable price. The economic bubble created by tulip sales burst and the government capped prices, but Holland would be forever synonymous with the flower. Being annuals makes tulips more expensive to plant on mass than their perennial cousins and so, especially in the last years of recession and budget cut backs, they have been replaced in public displays by the cheaper daffodil. Dutch tulip growing has been almost exclusively for export and that’s what Albrecht wants to change. 2016 marks the second year of the festival. Last year they planted over half a million tulips in beds and pots around the city and this year they have done so again, pushing on towards that ultimate goal of a bulb for every inhabitant. The festival runs from 31st March for the whole month of April, giving more than enough time for visitors to catch swathes of tulips in bloom whether the weather is cool or warm. Successful partnerships have been established with Ibulbs, one of the major wholesalers of tulip bulbs, who have provided 30,000 for this year’s festival and head up the ‘Bulbs4kids’ program for primary schools. This means there will be huge displays in the Vondelpark come April, planted by local primary school children, that wouldn’t have been there otherwise. ‘I hope that from next year it won’t just be the Vondelpark, but also parks in north and east Amsterdam too’, Albrecht says. ‘In places where there is nothing else, it’s a great substitute and in this way you can also display far more flowers’, Albrecht noted. Look in the fountain on Museumplein, alongside the roads on Van der Pekstraat in Noord, the wharf outside the Eye film museum and Nemo, the science museum. Some 30,000 bulbs have been planted in beds near the Maritime Museum and 25,000 more at the Rijksmuseum; everywhere there is an effort to make the displays complement the architecture. The site specific planting of Albrecht’s city-wide design is cleverly developed to make the whole city light up with colour, come April, and she has personally overseen it all; running the charity alongside her freelance work. ‘Together we make the city beautiful, I want to inspire people to do that,’ she says. Tulp Festival Amsterdam runs from March 31st to the end of April at locations throughout the city.